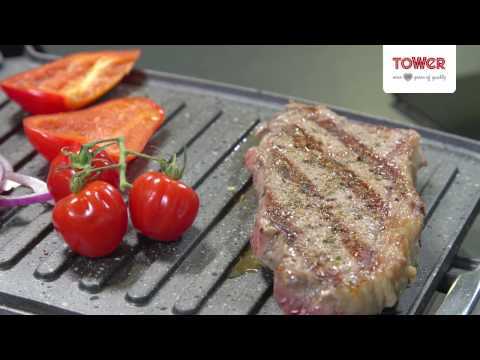 Stylish, robust and extremely easy to use, the 180 Degree Panini Grill from Tower is the ultimate multifunctional grilling appliance for the discerning cook. With easy-clean non-stick Cerastone ceramic plates, the grill is perfect for creating deliciously crisp paninis as well as grilled meats, fish and vegetables, giving you a healthier way to enjoy your favourite foods. A hinged floating lid allows you to adjust the grill according to the thickness of your ingredients, while the specially designed grill ribs and double sided cooking plates ensure even grilling and create the perfect grill marks on your food. The grill gives you complete control over the temperature and a drip tray is on hand to capture excess fat for delicious, reduced fat meals. Not well made and arrived with grease on the cooking plates. The wire needs to be at least 20 cms longer. The instruction manual talks of the lock on the side to prevent the cooking plates from moving in storage. There is no lock! I checked with customer services and they could not find it either. Strange piece of shaped black plastic was loose in the box. Once again customer services could offer no explanation of what it is. The control knob is cheap and nasty and appears flimsy. Good that it has a 3 year guarantee - I will be amazed if I am not availing myself of it! I finally received my order. I put it my bread this morning and it’s absolutely delicious. The product is very good and worth it. The panini grill is a super addition to the kitchen. I've used it to cook steaks, chicken, burgers and veg and has cooked beautifully. It's easy to clean and store. Would recommend this health grill. The Tower 180 Panini Grill yes what a good purchase. Since our recent purchase we have used the Grill 4 times and each time cooking very good, from burgers too chicken no problem. If like us you get fed up with the uk weather especially when you have planned to BBQ now it is no problem just bring the Tower Grill out and away you go. I am very pleased with the panini grill as it heats up fast and cooks food perfectly. When my grandchildren visit they like food made quickly and so I am delighted with this appliance and overall rate it as very good and would recommend it to anyone. This is absolutely brill I've cooked everything on it so versatile and quicker than an oven. Best thing I've bought in years.